In December I love to take my students on a world tour, discussing how holidays are celebrated in different countries and cultures. In Part One we traveled to Germany, Australia, Russia, Denmark, Spain, England, France, South Africa, Ghana, Liberia, Ethiopia, Canada, and Greece. Now the world tour continues! Most people in India are not Christians, they are Hindu or Islamic. However, there are Christians in India who celebrate the holiday. The following picture books are not Christmas books, but they are great books about Indian art and culture! Lamps are an important part of both Christmas and Diwali celebrations in India, so while visiting the country each child makes his/her own little lamp and plays a game that practices greater than, less than, and equal to. In Sweden, not only do children celebrate Christmas, they also celebrate St. Lucia Day! While in Sweden we practice composing and decomposing numbers with Swedish buns, practice reading nonsense words as we gather lights and stars, and we make St. Lucia wreaths for the girls and Star Boy hats for the boys. The United States of America is the home of the beloved Christmas story, The Night Before Christmas, so we definitely need to have a reading of the story while there! I also love sharing the Christmas songs from "Super Simple Songs" with the students while in the United States. The children love these fun and active tunes! Also in the United States, we practice blending phonemes, or switch the skill to segmenting while decorating a tree, we read sight words to the tune of jingle bells, and make Christmas gifts for the children to give to Moms and Dads. Next it's time to head off to the ocean. We head to the Bahamas and the Christmas carnival parade: the Junkanoo! While in the Bahamas, we practice producing and expanding complete sentences and then the children make a "starfish" ornament to hand on their Christmas tree. Now we're in Peru, which has it's own winter holiday called the "Festival of the Sun". However, since Peru's seasons are opposite ours, they celebrate their winter holiday in June! During Christmas time it is warm in Peru, and so part of their Christmas celebration is a huge fireworks show. While in Peru we practice classifying and sorting, practice reading sight words, and then make a yummy Panettone snack. Israel is a very special place to those who celebrate Christmas, because this country is the place where Jesus Christ was born. However, though there are Christians in Israel, most of the people in the country are celebrating Hanukah. While in Israel we practice decoding words while walking to Bethlehem and make a shining Christmas star. Mexico is home to a beautiful Christmas procession that occurs on December 16 called Las Posadas. It is also home to the Christmas flower La Flor de Nochebuena or the poinsettia. One activity I love to do with my students while in Mexico is to break a piñata. You can purchase a piñata or make one out of a brown paper grocery bag. I love to use this song by Nancy Stewart to teach the children about the piñata. I love all of Nancy's songs, and you can find more information on this song at her website. In Mexico we make poinsettias and practice recognizing the letters of the alphabet. Most Chinese citizens are not Christian, but there are Christmas celebrations in large urban centers of China. Chinese New Year is a much larger holiday in this country. While in China we practice writing letters and the students make Chinese lanterns. Italy is home to the Christmas witch La Befana whose story is told in typically beautiful fashion by Tomie De Paola. In Italy, students practice substituting sounds with La Befana and make an Italian ceppo. Our last stop is Scotland, where Christmas was banned until 1958 and is now celebrated in a quiet fashion. Here we practice number names with some mischievous elves and make a shape elf. You can find all of these activities in our Christmas World Tour Part Two packet and supplementary materials in our Christmas Around The World Scrapbook. Both are available here and at our Teachers Pay Teachers Store. Here is an overview planning sheet that is included and shows everything that is included. 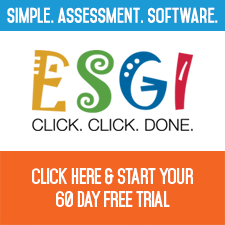 Newer PostAre You Making The Most of ESGI?